Great Danes are huge, powerful and elegant dogs. Males can reach 32 inches tall and weigh anywhere from about 100 to 120 pounds, while females may be 30 inches tall and weigh about 100 to 120 pounds (45 to 59 kilograms). The Great Dane’s massive head is narrow and flat on top. The eyebrows are prominent. The ears drop forward or are cropped to stand erect. The neck is long and strong. 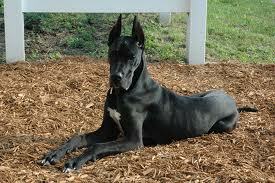 The Great Dane’s body is long, muscular and the front legs are straight. The tail is medium in length; it is thick at the base and tapers down to below the hocks. Great Danes are light to average shedders. The coat is short and sleek and comes in a variety of colors including brindle or fawn, blue, black or harlequin, which has black patches over a white background. The breed has poor longevity; Great Danes live only 6-8 years or less. Great Danes are considered gentle giants. They are moderately playful, affectionate and good with children. They will guard their home. Great Danes generally get along with other animals, particularly if raised with them, but some individuals in the breed can be aggressive with dogs they do not know. Great Danes are considered easy to train, but some Great Dane fanciers say that individuals can be stubborn learners. Anyone who wants a Great Dane must be willing to accommodate this dog’s great size. A Great Dane will eat far larger quantities of food than a small dog, so feeding is going to cost a lot more for a Great Dane than, say, for a tiny Chihuahua. A Great Dane must have room to move around and exercise, especially when he is young. Anyone wanting to keep a Great Dane in the city must be prepared to take the dog out for long, daily walks. Great Danes must be obedience trained to assure they are manageable when fully grown. A condition known as bloat, which involves gas buildup and possible twisting of the stomach, is a real possibility with a giant-breed dog such as the Great Dane. To prevent this potentially life-threatening problem, feed two or three small meals daily instead of one large one, and encourage the dog to rest for at least one hour after eating. Very large dogs also benefit from raised food bowls so they will not have to splay their legs to eat. The Great Dane, also known as the Apollo of dogs, is a giant breed. The Dane is German in origin, not Danish. The breed is thought to have been around for more than 400 years. Great Danes descend from mastiff-like dogs that were bred by German nobility to protect country estates and hunt wild boar. In the 18th century, Great Danes were prestigious guardians of estates and carriages. They were also popular with the upper class for sport, as few other dogs could bring down a wild boar. The Great Danes that were more like those we know today were developed in the 1800s. In 1880, the Germans banned the name “Great Dane” and called the breed “Deutsche Dogge,” which means German mastiff; however, the breed continues to be called Great Dane in English speaking countries. These dogs are primarily family pets and, despite their size, have become popular among city dwellers who keep them to help guard against robbers. ← Why Should I Brush My Dog’s Teeth? I owned two Great Danes. They are GREAT Dogs. Falls Road Facebook Fan Page!